Do You Have Chronic Pain from a Car Accident? Auto accidents are traumatizing. If you’re lucky, the only damage inflicted was to the vehicle, and not any people in the car. Unfortunately, serious car accidents rarely result in drivers or passengers coming out completely unscathed. A car accident only takes a second, but chronic pain can last a lifetime without the proper treatment. Compensating for a damaged area of the body by making another area work twice as hard is just one of the problems that can contribute to a lifetime of pain. When the body isn’t positioned in the right ways because of an injury, when muscles and joints aren’t working properly, when bones or limbs are weak, you will find other ways to make the body move. These compromises are not always good for your overall well-being, or for minimizing pain. Whether a rear-end collision, head-on collision, side-impact collision, or otherwise, any car accident can result in serious, painful injuries. But the chronic pain doesn’t have to be permanent. There are many spinal or disc problems that can result from a car accident. 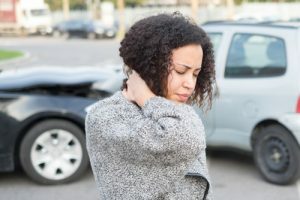 Any neck or back injury that damages soft tissue or connective tissue occurs when there is a sudden or unexpected movement, like a collision. If, even years after an accident, you are still suffering with pain, you don’t have to live that way anymore. What Can Functional Medicine Do for Chronic Pain? Soft tissue injuries, like strains or sprains to the back and neck especially, do not necessarily require invasive medical treatments. A soft tissue injury may sound minor, but the fallout can be major, and the pain unbearable and long-lasting. It may feel like you need seriously involved medical attention to tend to incredible, debilitating chronic pain. That’s not necessarily so. Functional medicine treatments can minimize and sometimes eliminate the pain that has been ruling your life. Disc or sciatic pain may be coming from a disc bulge, disc herniation, spinal stenosis, or degenerative disc disease. Or you may be suffering from neuropathy. Getting the accurate diagnosis is critical to ensuring that the right kind of therapy follows, whether that be muscle awakening, massage therapy, spinal decompression, spinal disc therapy, or otherwise. Maybe you’ve been told that you must learn to live with chronic pain, but don’t settle for one opinion or allow it to control the rest of your life. Seek healthier outcomes. Become stronger. Say goodbye to pain. Enjoy a revitalized you. Contact the Restorative Wellness Center in Ann Arbor to schedule your consultation and get off the road of chronic pain.